Background: People in middle/later age often suffer from heart muscle damage due to coronary artery disease associated to myocardial infarction. In young people, the genetic forms of cardiomyopathies (heart muscle disease) are the utmost protuberant cause of myocardial disease. 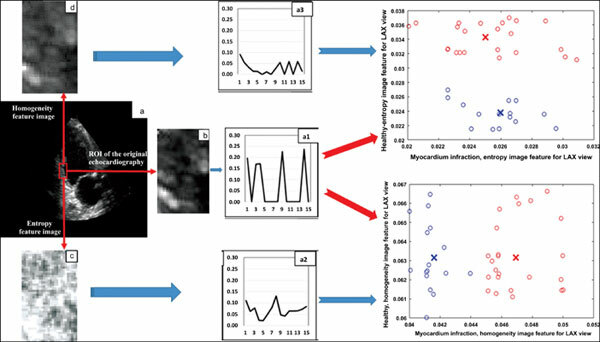 Objective: Accurate early detected information regarding the myocardial tissue structure is a key answer for tracking the progress of several myocardial diseases. Method: The present work proposes a new method for myocardium muscle texture classification based on entropy, homogeneity and on the texture unit-based texture spectrum approaches. Entropy and homogeneity are generated in moving windows of size 3x3 and 5x5 to enhance the texture features and to create the premise of differentiation of the myocardium structures. The texture is then statistically analyzed using the texture spectrum approach. Texture classification is achieved based on a fuzzy c–means descriptive classifier. The proposed method has been tested on a dataset of 80 echocardiographic ultrasound images in both short-axis and long-axis in apical two chamber view representations, for normal and infarct pathologies. Results: The noise sensitivity of the fuzzy c–means classifier was overcome by using the image features. The results established that the entropy-based features provided superior clustering results compared to homogeneity. Conclusion: Entropy image feature has a lower spread of the data in the clusters of healthy subjects and myocardial infarction. Also, the Euclidean distance function between the cluster centroids has higher values for both LAX and SAX views for entropy images. Keywords: Entropy, homogeneity, image feature, texture spectrum, fuzzy c–means, myocardium. Keywords:Entropy, homogeneity, image feature, texture spectrum, fuzzy c–means, myocardium.